The 67km-long Réseau Électrique Métropolitain (REM) LRT is touted to become the world’s third biggest automated rail network. Image courtesy of Caisse de dépôt et placement du Québec. The project will involve the construction of new stations and refurbishment of existing stations. Image courtesy of Caisse de dépôt et placement du Québec. The REM LRT will be served by an initial 200 four-car/two-car trains. Image courtesy of Caisse de dépôt et placement du Québec. The trains will operate at a maximum speed of 100km/h. Image courtesy of Caisse de dépôt et placement du Québec. The stations will be equipped with elevators and escalators, and will be Wi-Fi enabled. Image courtesy of Caisse de dépôt et placement du Québec. Artist’s impression of the interior of a typical station for the REM LRT. Image courtesy of Caisse de dépôt et placement du Québec. Réseau Électrique Métropolitain (REM) is a fully automated light rail transit (LRT) project proposed by CDPQ Infra, a subsidiary of Caisse de dépôt et placement du Québec, to serve the major metropolitan areas in Montréal, Canada. The new facility will link downtown Montréal, South Shore, West Island (Sainte-Anne-de-Bellevue), North Shore (Deux-Montagnes), and the Montréal-Pierre Elliott Trudeau International Airport. The project is expected to create approximately 7,500 jobs during construction phase and 1,000 permanent jobs when operational. It will also help reduce approximately 16,800t of greenhouse gas (GHG) emissions a year. The REM LRT project was announced in April 2016, construction woks are expected to start in the first half of 2017 and commercial operations are expected to begin in late-2020. With an overall length of 67km, integrating ground, underground and overhead double tracks, the LRT is touted to become the world’s third biggest automated rail network. "The project is expected to create approximately 7,000 jobs during construction phase and 1,000 permanent jobs when operational." The LRT will comprise two sections, including the South Shore Branch incorporating the A10/Downtown Montréal corridor, and the Western Branch stretching from Downtown Montréal to the Pierre-Elliot-Trudeau Airport, with connections to Sainte-Anne-de-Bellevue and Deux-Montagnes. The South Shore Branch will cover a total length of 15km and incorporate five stations, two bus terminals and two parking facilities, and involve the construction of 1.3km of new cut-and-cover tunnel and 1.6km of tunnel through rock. The Western Branch will cover a total length of 52km, and incorporate seven new stations and 12 existing stations, which will be refurbished, seven bus terminals and 11 parking facilities. It will also involve the construction of new tunnel measuring between 2.5km and 6km in length. The project design provides an option to add five additional stations, including two stations to serve the McGill University and Université de Montréal areas, based on demands in the future. Each of the enclosed and climate-controlled stations will be accessible by foot, bike, bus and car, and the platforms will be approximately 80m-long. Each station will be equipped with escalators, elevators and platform screen doors and will be Wi-Fi enabled. The developer has reached an agreement with the Canadian National Railway Company (CN), under which the former has agreed to acquire the aerial structure leading to the Central Station (Viaduc du Sud), long-term use of the Central Station, which will serve as an inter-modal hub, and use of the CN tracks on the Pointe-Saint-Charles sector. Other major infrastructure will include a centralised control station, rolling stock maintenance and storage facilities, administrative offices, telecommunications facilities, an electrical substation, and bike racks. 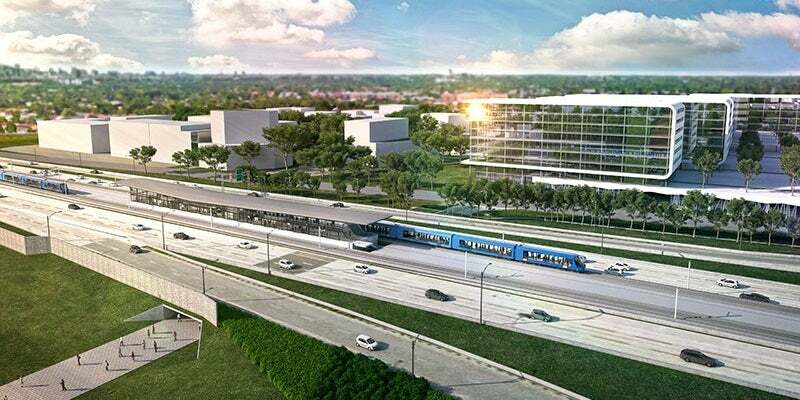 The project proposes the use of an initial 200 cars to operate on the LRT. Each vehicle will be approximately 80m-long and 3m-wide, and have a maximum axle load of 14.5t. The rolling stock will incorporate four-car trains during peak hours and two-car trains during normal hours. Each train will be capable of accommodating 150 passengers. The automated trains will have a maximum speed of 100km/h and will be powered by electricity supplied through 1,500V catenary. The engineering studies for the South Shore Branch were performed by CIMA, while the engineering studies for the Western Branch were performed by Hatch Mott MacDonald, as part of the project’s environmental impact assessment (EIA) study. Other consultants involved in the preparation of the EIA report include Systra, SETEC, Groupe SM, and Canarail. Steer Davies Gleave performed the ridership studies for the project. The overall investment in the Canadian LRT project is estimated to reach $5.5bn, of which the developer will provide $3bn and the remaining will be met through contributions from the governments of Québec and Canada.